“Professional services firms must go through their own digital transformation before they can truly help their customers. Traditional management consulting partnership models and their silo-practices are unlikely to deliver CIOs the most appropriate solutions for a digital age. 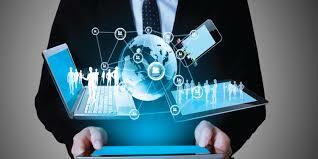 CIOs do not need a digital strategy. They need the right support to survive and thrive in a digital economy”. Forrester’s analyst . In my few years of consulting experience, with both firms technology focused like Accenture as strategy/operation focused like A.T. Kearney, “digital transformation” has become more and more a key proposition for the firms and their clients. I was frequently staffed on digital transformation projects along different stages of the process, from the redesign of the business model to the actual implementation. At the same time, I also experienced how both consulting firms struggled to internalize those tools and measures that recommend to their clients, starting from very simple ones as video conferences and tele-presence tools. As a consultant, I had to fly multiple times a week across various locations even just for a meeting that could have been easily done virtually, with significant cost savings for the client. 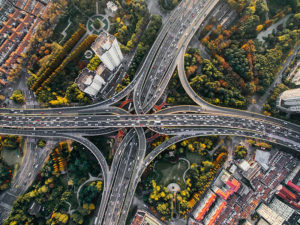 Analyzing the problem from a bigger perspective, we can all agree that digital transformation represents a great opportunity for consulting firms, both externally and internally. A recent report from Source Global Research found that digital investments are mainly focused on fueling growth, while cost efficiency still remains a priority for many companies. SGR conclusion is based on their last industry survey where 52% of respondents stated that growth is one of the two most important factors driving investment in digital transformation. If we consider just the largest firms (with annual revenues above $5 billion) this figure rises to 73% among respondents . According to the same report, the global digital transformation market was worth around $23 billion to consultants in 2016, twice the size of the UK’s overall consulting industry. 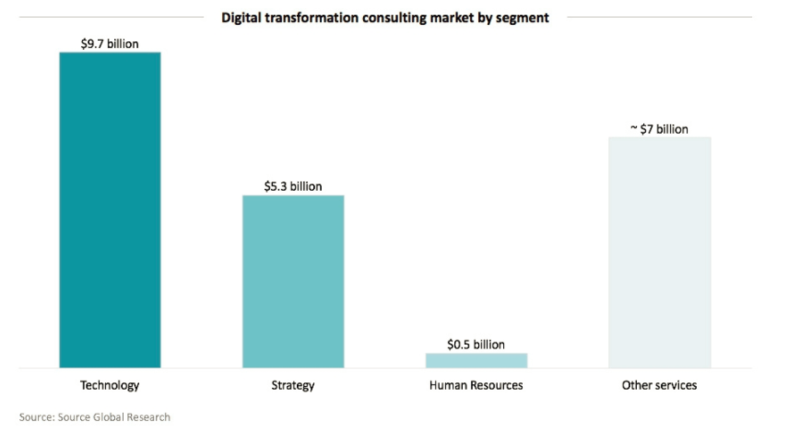 In America, digital transformation contributed to about 20% of the consultancy business, with $11.79 billion per year . The segment grew 17% in 2017, far beyond the 5% growth of traditional consulting . The main type of projects are related directly to technology (around $9.7 billion in value), while pure strategy projects are gaining share with roughly $5.3 billion value . As third category we find specific projects related to Human Resources transformation. The sub-segment is still a niche compared to the main two, but we can expect it will have increasing relevance as automation and global realignment of the workforce will occur. At the moment the “Big Four” (Deloitte, EY, KPMG and PwC) dominate the market with more than 20% of it collectively. The next two biggest players are Accenture taking 10% of the market, followed by McKinsey & Company at 9% . Consulting firms followed different strategies to deliver digital transformation projects, with a strong focus on how to best serve their clients externally more than how to embrace a digital culture internally. Deloitte was the first one to create a separate digital unit called Deloitte Digital, followed by Accenture Digital in 2013, and BCG Digital Ventures in 2014 . Other firms have instead established digital teams that work across units, so that digital expertise can be transferred across sectors and easily applied to any project in a flexible way. Such firms include Oliver Wyman, KPMG that set up a one-stop shop team for advice on areas related to technology, and PwC. Thanks to attractive elements of the consulting job such as low risk, higher salaries, diversified work experience and fast career growth, firms are able to attract the best talents and allocate them to their digital transformation teams. On the contrary, traditional companies struggle to attract the best digital talents and often don’t have the capabilities to implement a digital transformation without external help. For this reason, we see digital transformation as a massive opportunity for growth for consulting firms across the board, as businesses will have to fundamentally rethink their business models and processes to succeed. Given the magnitude of change that firms are facing in the form of digitization, client companies will be very selective in choosing their business partners and will be willing to pay high consulting fees to make sure their business doesn’t get disrupted in the digital age. However, consulting firms still have many challenges to address to be able to exploit at best this opportunity, and to avoid being disrupted themselves by new forms or automation. First of all, every firm needs to find the best way to integrate digital expertise into their organizations, whether as separate or cross unit teams. Second, they will have to keep attracting new talents to increase the size of their digital teams, at a higher rate than their traditional hiring rate for strategy projects. McKinsey’s analytics team has 1,700 people and this is due to rise to 3,000 by the end of 2018, according to Senior Partner Nicolaus Henke . PwC has doubled the size of its technology consulting team in the UK over the past five years, and expects to do so again in the next five years . Given the challenge of attracting talents organically, firms are seeking to bring in talent through acquisitions. McKinsey has made 14 acquisitions focused on digital and analytics over the past six years. Oliver Wyman bought LShift, a software developer, in 2016. Accenture bought digital design agency Fjord in 2013, while KPMG has acquired 12 digital-focused businesses in recent years. Another critical challenge for consulting firms will be to create differentiation among firms, as they have assembled a similar set of assets and expertise. Finally, the biggest challenge will be the cultural chance that necessarily has to happen with a shift from a traditional business to a digital one, both for the clients and for the consulting firms themselves. Externally, clients may be tasked with delivering short term results and may push for quick fix solutions. These shortcuts could prove risky both for the client – who may find the solution obsolete in a very short time – and for the consulting firm, who can suffer from reputation risks. It will be crucial for companies and consulting firms to establish partnerships with long term horizons. Internally, consulting firms may be reluctant as well to change and to implement new technologies that challenge the status quo. Two main sources of innovation, as well as disruption, are represented by AR/VR and crowd consulting. AR/VR techonolgies – enabling consultants to interact with clients remotely as if they were “on-site”, could improve the life styles of consultants, facilitate hiring and retention of the best talents, as well as reduce project costs significantly. Crowd consulting could provide great value to the clients, allowing them to access to the best possible expertise and insights irrespective of which firms they choose or team they are assigned. Will consulting firms be able to help their clients go through digital transformations successfully, while at the same time digitizing their own business and operating model? The next few years will be crucial in defining the answer to this question, and ultimately the fate of many consulting firms. Digital transformation consulting market booms to $23 billion, 30 May 2017, Consultancy.uk. Management consultants split on how to make digital add up. January 17, 2018. Financial Times. 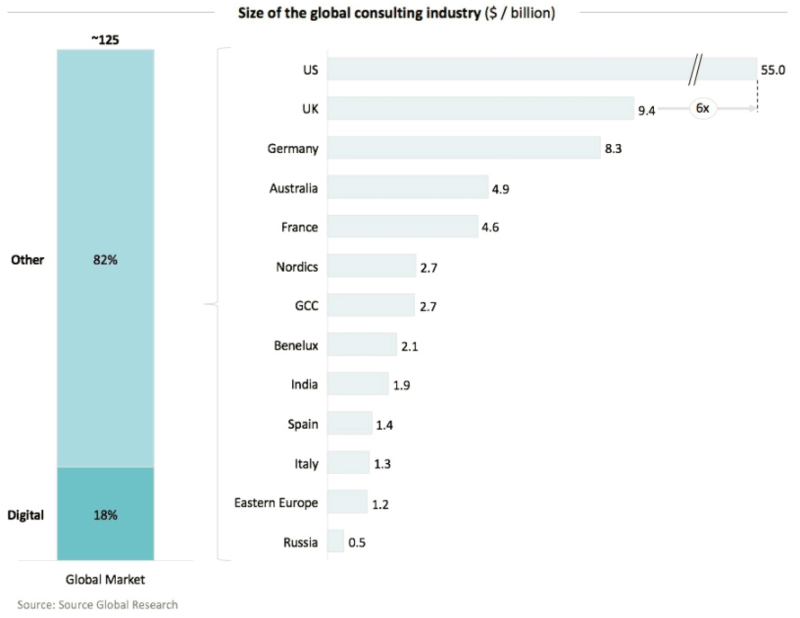 Digital Transformation Is Changing The Market For Consulting. August 16, 2014. Forrester. Every technology services company wants to build its consulting practice, but are they right to do so? February 6, 2018, Source Global Research. What I found most interesting is the move of the big consulting firms towards creating separate units dedicated to digital. Although I think that as an initial step this may help overcome some of the cultural resistance and internal push-back, I also see it as a source of potential future conflict. As the world becomes increasingly digitalized, more consulting projects will inherently need digital know-how within the team. If the digital units are completely autonomous, how will best practices flow to traditional operations and traditional clients? Will this limit the firm’s ability to provide their clients with the best solution out of fear of losing the client to a different unit? As you mention, I agree that the next few years are crucial. Regarding the acquihire processes, I believe consulting firms should be very deliberate in the integration of the new businesses to their practices. If integration happens to quickly, there is significant risk of losing the value for which the company was acquired. Very interesting post! It’s interesting that many consulting firms have chosen to integrate digital expertise on their teams through acquisitions. Since these acquisitions are entirely new business models for traditional consulting agencies, I hope that once they acquire the businesses they are keeping the organization as a separate unit. As we learned in BSSE, “RBM” acquisitions are often more effective when kept as a separate unit since they don’t risk being absorbed by the larger, more mature organization. It will be interesting to explore how the companies have integrated these acquisitions into their broader organizations. Thanks for the great post! You hit the nail on the head: digital talent is crucial for the future of consulting firms, but they are struggling to attract, integrate, and retain top digital talent. I completed a summer internship with a top-3 management consulting team, and we had an IT-transformation specialist embedded in our consulting team on-site with the client. His technical skills were superb, and super useful to the client, but I overhead doubts and questions about whether or not he “looked” like a consultant (i.e.– clothing choices, hair style, etc.) and whether or not he “presented himself” like a consultant was excepted to (i.e.– his style of speech, his tone when speaking to the client). I thought these were quintessentially legacy consulting judgment criteria that aren’t as relevant for helping clients achieve digital transformation. These are the types of challenges and resistance consulting firms face to transforming themselves. Totally agree with Austin’s point of view. It seems the framework of “RPPs” learned in BSSE, which therorizes that every company is limited by its resources, processes and people (all coalescing into its culture), is a key lens through which to examine this situation. Consulting firms, while knowing full well where they should be headed, are held back by their very culture that stands against that. I loved the title of this post and found the content to be extremely interesting. I agree that talent development is the main constraint. In an age of information abundance and as more and more companies are truly integrating digital technologies into their operations in order to improve production and reduce costs and make more effective decisions, I can’t help but also wonder how relevant consulting firms will be in the near future. I truly believe that data scientists and talented strategic visionaries will be to businesses what consultants are to them today. Great post! Very interesting to learn about all the acquisitions and to read about consulting companies struggling to become more digital themselves. I think there always will be a trade-off of speed (doing thing through video conference) and client relationship building. 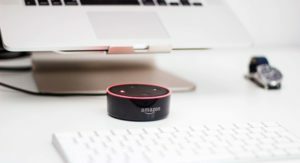 Given that any advisory business is primarily based on the latter, I don’t believe that digital will ever fully replace the in-person meetings, and thus I don’t see the lifestyle of consultants to change significantly soon (hopefully I’m wrong! ).